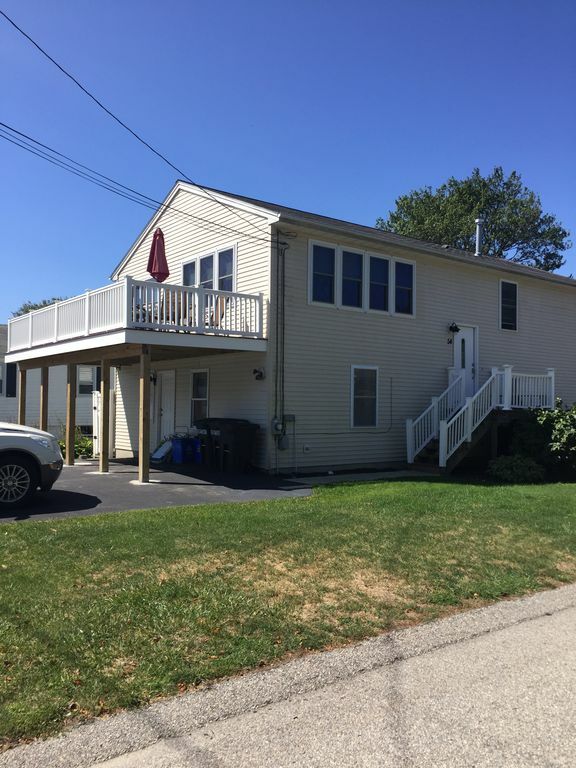 The address of this property is 54 Greenbrier Road, Narragansett,RI. Also there is central air conditioning. There is NO WALK ON FEES FOR THE BEACH. In JULY and AUGUST, we only rent Sat to Sat. 7 day min. I am Joanne. I am in my 50's and live in Matunuck RI. I have a son 23 and daughter 18 and have been married to Dave for 28 years. I work on the Acela trains. Been with Amtrak 34 years. My passion is beach houses, renting them, decorating, updating them, etc. I am doing what I love by owning 3 of them. The pictures don't do justice to this house. We decided to have a big family vacation which included 7 adults and 4 children. There was more than enough room for everyone to spread out and have fun. The location is great. A quick walk/scooter ride to the beach. Close by the grocery store, restaurants, mini golf, coffee shops, etc. The kitchen was fully stocked with dishes, pots, pans, 2 fridges. We cooked almost every night and also baked a couple times. Everything we needed was there. And most important we knew that if anything came up Joanne was just a phone call away. This is the 2nd house we've rented from Joanne and both houses (greenbrier and st james) met our needs exactly. The location is perfect - a short walk to the beach, even for my 3 yr old! We had 4 families and plenty of room. The open family room/kitchen area was the perfect backdrop for game night and we watched a lightening storm from the deck off the kitchen. We saw fireworks on 2 different beaches, caught the ferry to Block Island and had dinner at Aunt Carrie's - all the traditional RI expeniences. A fantastic week weather wise was just complemented by a comfortable, clean home away from home... Joanne is great to work with, and we will definitely rent from them again. My boyfriend and I just got back from an awesome week renting this house. There were 6 in our family that stayed all week, and this house had MORE than enough room. The bedrooms were very nice and spacious and the whole house had a nice homey feel to it. The location couldn't have gotten any better. It's so close to the beach, about a 5-7 minute walk, and to the grocery store, shops, great restaurants, block island ferry. We had an awesome week and have already talked about renting from Joanne again next vacation! 6 bedrooms with queen size beds were great. We loved staying here. My family and I have had the pleasure of renting this beautiful home for the last 7 years. It is spacious enough for a family of 12, as well as for friends that look forward to yearly visits. The house is always well maintained from extra pillows to a stock pot to cook the fresh lobsters bought right off the local docks. There are so many different things to do, we have taken trips to Block Island and Newport, taken bike rides along the ocean, played tennis, gone fishing and enjoyed many local restaurants. I would highly recommend this home. Here are some ideas I thought of today for you to Google and think about.